Is your user truly connecting with your content, or are you relying on luck? Think about how you have approached your content creation strategy. Was it done six months ago? You probably channeled a tremendous amount of resources into the project and expected your content to show you as a thought leader. Maybe you planned out an editorial calendar for the entire year. But, what if your content is not speaking to your target audience? The reality is that no matter how much you try to make your strategy perfect at the start, the odds for success of a rigid strategy are very low. And why? Both your company and your content live in a world that changes constantly. Market conditions may change, your users may stop behaving like you expected, or you may encounter an unexpectedly successful content type. The ability to adjust your content strategy accordingly can give you an edge. The answer is to create responsive content that reflects your user’s current needs, rather than an idea that was generated six months prior. For this strategy to work, you must be nimble and quick. You must be agile. To be successful with agile, start small and simple. To help you grasp this read Gerry Moran’s blog about 10 Simple Ways To Think About Content Marketing. Once you start, you will learn how your content can be adapted and improved based on feedback, and you can adjust quickly. 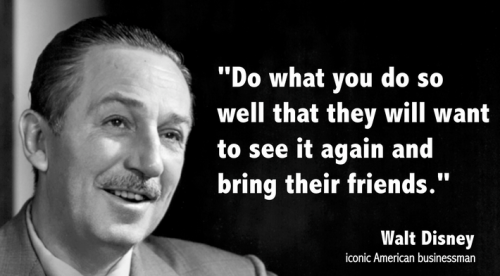 Try this approach through multiple iterations. The iteration in agile development represents a timeboxed cycle of Content Items production. In this use case, we will show you how Yanado can help you with applying the agile approach in your content marketing efforts. What You Should Start With? Start with setting your business goal. Think about how your content fits into your strategy. Example: You may want to raise awareness of your brand, and improve your brand’s likeability. You hope that you will see an impact in your overall business with an expanded customer base, and increased brand loyalty. From there, you can define your goal by making it as specific as possible. Make it trackable so you can measure your success. Example: Your goal is to have 1,500 new users in the next 3 months. Once you know what you want to accomplish with your content, the real work begins. Tom Pick, suggests on his blog Webbiquity, that you should think like a reporter. Take the time to build the foundations of your content strategy or some broad ideas to start with. Use this as a living framework to evolve your content with each iteration you make in order to see better results. Consider your target audience. Who is your user persona? Focus on the characteristics of the users that are relevant to how they interact with your content, product or a service. What problems do they have and how can you help them? Use your content to take your users from point A to point B through your site. The journey starts with a specific topic of interest and leads the user to your solution. Example: Our target audience is project managers and team leaders looking to better manage their teams and projects. Once you understand your user persona, you will think of what your content has to have in order to be interesting for them. What are the features that will make it stand out and what is the message behind it? Example: As a content writer, you can generate engagement with interesting storytelling, and increase credibility with examples or research insights. You can also ensure that your content is practical by giving clear action steps for your user. Oh – and everyone loves a funny GIF! A clear idea of your target users and content expectations gives a good base to further explore. This is where you brainstorm and anticipate content ideas, optimal publish times, and promotion strategies. Doing a bunch of research on this matter will guide you in making your own educated guesses. For example, going through web analytics and keyword performance, or analyzing your competitors to find the insights. You can also survey current customers about the topics of interest. Determine how much time you want to spend on content production and measurement. This is the actual length of the iteration. The trick is to keep it short enough to get measurable results while also being able to change direction in a timely manner. The length of time depends on your business goals and team’s capability, most iterations last from one week to one month. Before jumping into your first iteration, make sure you plan and organize the workflow. This is where the power of Yanado comes into play. Yanado helps your content marketing team visualize the whole content creation process and keep track on the progress. Start with creating a separate Yanado List, and name it e.g. Content Marketing. 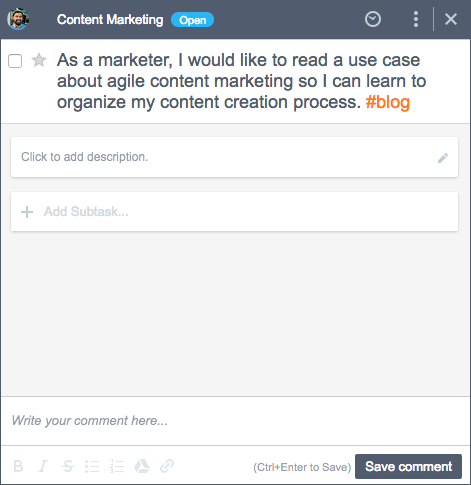 Invite everyone involved on your content marketing team. The next step is to create the Statuses. NOTE: You can make these statuses in Yanado and save them as a Template you can then easily choose and apply for managing your content development process across different projects and teams. Marketing agencies can even use templates with other clients. All those content ideas your team collects need to be put in one place, accessible for anyone on the team before work is started. This place is called Content Backlog. Practically, Content Backlog is a list of Content Items or Tasks your team will be working on. Next is to start adding Content Items or Tasks in the Content Backlog column. The best way to define the Content Item or the Task is to write it as a User Story. User Stories define the intended purpose of the content from the users perspective. This is a great way to focus on specific user needs during content creation. A good User Story is specific and to the point: As a (user persona) I would like to (experience this type of content) about (the topic) so I can (accomplish this). 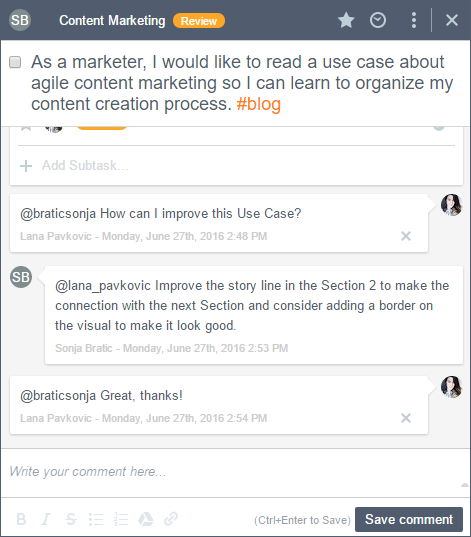 Example: As a marketer, I would like to read a use case about agile content marketing so I can learn to organize my content creation process. 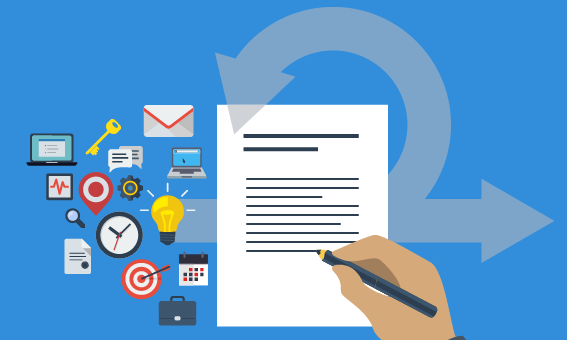 With this user story as the guiding force for content, you can make sure everything created will help to meet a high-level need with your target audience. To point out, the Content Backlog serves as a living reserve of items, constantly changing with new and ejected topics as a team brainstorms and ideas evolve. Items could be well defined and ready for production, or could be less specific and still need to be more thought through. Before your team starts working on the Content Items from the Content Backlog, you will need to decide which items should be prioritized. This is something you decide before your team starts the iteration, so they know what Content Items need to be produced and published during the time. These decisions depend on business goals, strategies, and the capacity of your team during the iteration. Example: Our Team Dynamics section on the Yanado blog was started because the content around this topic is something our target users are interested in the most. We had a bunch of ideas for topics, and we decided to write about “How to build a team” first. After all, managing team dynamics starts with the need for a team, and building a great one determines later results. This was our starting point for building a comprehensive blog section. Once you decide which Content Items are most important, you will drag the Content Items into the Open status. So, Items in this column are the ones that should be produced next, by the order of priority. The Item on the top of the column is the first priority. The important thing about the Items your team will be working on is that each should have the Definition of Done – the point at which the Content Item will be considered as done. In Yanado you can use Task Description to create these specific guidelines. Choose the Item from Open list, and then “Click to Add Description“. 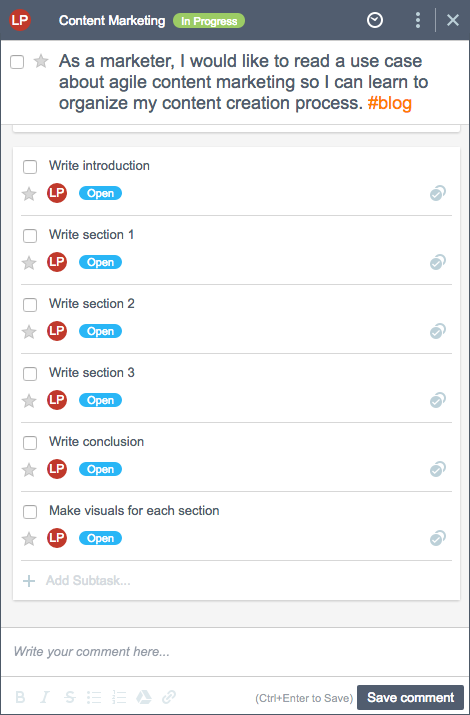 You can also use Subtasks, to break down the Item into smaller steps. Choose the Item from Open list, click, and then select “Add Subtask”. This is where the Items live while the team is in the writing process. Draft content is created here. So, once you start working on the Item, you will drag it in this column. Another way is to go to the colored status icon to change the Task status into In Progress. It will automatically place it in that column. You will also Attach the document where you will be writing it. Once the draft version of the Item is done you will move it into this column and for the first Review. At this point, teammates can give feedback. To do this in Yanado you will Mention users on your team by typing @all, or specific users by typing @username, in the comment section inside the Task to alert users via a notification about your draft Content Item available for review. Teammates can leave feedback by opening a Task and leaving Comments in the bottom. Or, teammates can meet in person to review and provide feedback to improve the Content Item. Changes can be easily dropped back into the In Progress column for later reference. Once the Item is finished, any changes should be put in the Editing column. This is where you can Assign it to a language reviewer for editing. Opening the Task, click on the User avatar and choose a teammate from the list. Your teammate will receive a real-time desktop notification about it or will click the Notification icon in the right upper corner of the Window to able to see it. Once the editing is finished, the Item is moved to Ready To Publish column. Here you can add a due date and schedule the time for publication. Open the task, click the Due Date icon, and Select the Date and Time. Google Calendar will automatically save all due dates to create an editorial calendar and help manage multiple release dates. At this point, you can also add additional Subtasks to specify how and where the Content Item should be promoted and also add due dates for those. Once the Content Item is finished and published you will move it to the Published column. Once the iteration is finished, reviewing your work based on the responses of your audience is the critical step for agile content development. After the audience has engaged with your content, reflect on what was done by measuring the performance and looking for insights to point you in the right direction. To be able to analyze your content’s performance, look for engagement metrics (e.g. page views, the number of sign-ups, sharing and reactions…) and seek feedback. Did the content help your users? How it can be better? And what were the most successful parts? These insights will help you tailor your content strategy to make better decisions. Instead of utilizing a stagnant content strategy, your team is able to review and improve for better content in the future. Everything you decide to change and improve in your content will need to be planned and applied in the next iteration. So the process is simple, measure and iterate. Repeat. The quality of the content should increase incrementally and garner better results as you go. Though your brand’s objectives and overall content strategy may not change, the actual content you create probably will. You should embrace this. Thanks to digital content distribution, you have the ability to monitor and understand your consumer and deliver exactly what they want. Listen to what they’re saying, observe how they’re viewing your content, and make changes as needed while staying as close as you can to your overall strategy and objectives. What are you waiting for now? Install Yanado, invite your team members, and become one of the top content marketing teams in the world!